I would like to make all my replies in Gmail "Pop out" replies such as shown in the screenshot below. Is this somehow possible? I just learned that by holdning down Shift while clicking the Reply button, you get the pop-out window you want. Also, keyboard shortcuts let you easily open a pop-out menu for replies. 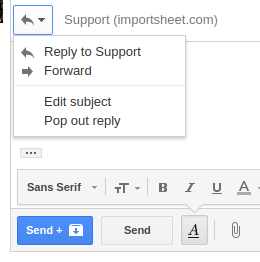 With keyboard shortcuts enabled, when viewing a message in Gmail, pressing R opens the reply area below the message. Instead of pressing R, press Shift+R, and the pop-out reply window appears instead. Add the Auto Bcc for Gmail™ & Inbox™ extension. There is an option in the extension to auto pop out all reply's. How can I use the normal (desktop) Gmail on an iPad? Which email services “thread” email conversations into 1 item in the inbox (like Gmail does)? How can I open the Gmail reply composer in a separate window? In Gmail can we make 'is:unread' the default view?